Sunday’s 2019 Golden Globes dipped in early TV ratings, posting a 12.7 household TV rating/21 share from Nielsen. The overnight rating is down almost 5 percent from 2018, the share is even. Last year’s Golden Globes, hosted by Seth Meyers, earned a 13.3 household TV rating and 21 share from Nielsen. Though those results was even with 2017’s data, when all markets were tallied and timezones adjusted, last year’s overall Globes viewership sank 5 percent from 2017 (19 million vs. 20 million). In other words, this initial -4.5% could change too. It’s worth noting here that the Seattle market is currently excluded from the 2019 numbers, making this a 55 vs. 56-market comparison. That’s imperfect, but the lone omission is unlikely to change the trajectory of these returns. 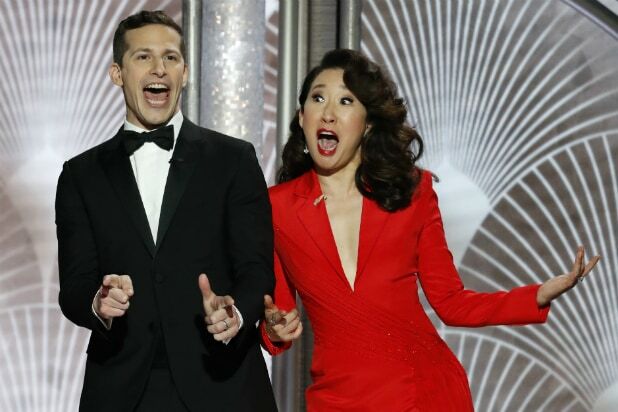 This year’s Andy Samberg and Sandra Oh-hosted special had the big advantage of an NFL Playoffs lead-in. And that game went down to the wire, too, with the defending Super Bowl Champion Philadelphia Eagles earning a road win off a double-doink field-goal attempt by Chicago Bears kicker Cody Parkey. 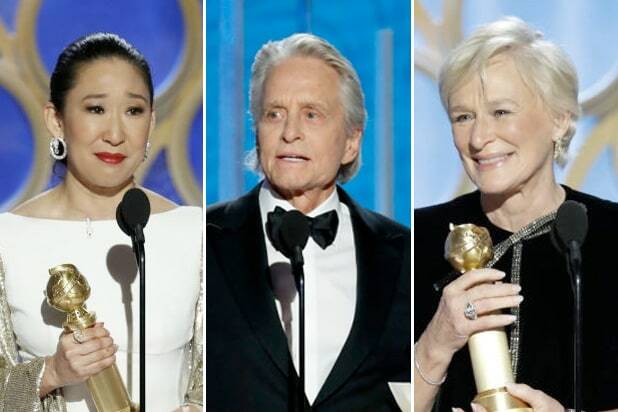 Despite the year-over-year decline, NBC’s Globes were TV’s highest-rated non-sports show since March’s Oscars. While shedding 4.5 percent of the prior year’s overnight rating is never a good thing, things could be worse. The latest Academy Awards (-16%), Grammys (-20%), Emmys (-10%), CMAs (-24%) and AMAs (-21%) were all down double digits from their respective previous installments. Fast-national Nielsen numbers for the entire broadcast will be available in a few hours, but those are not adjusted for the different time zones. So for now (and for a few hours), the metered markets stats are the best we’ve got. Final figures are expected later today. Find all of Sunday’s winners here.